With "The Gift", director Sam Raimi returns to the horror/thriller genre where he first made his mark as a filmmaker nearly two decades ago with the "Evil Dead" trilogy. 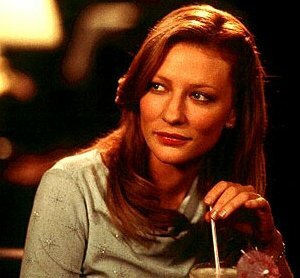 Working with a script penned by Billy Bob Thornton (who starred in Raimi's "A Simple Plan") and Tom Epperson (who co-wrote "One False Move" with Thornton), Raimi has created an atmospheric and engrossing supernatural thriller that is powerfully played by lead actress Cate Blanchett ("The Talented Mr. Ripley"). Unfortunately, as the film unspools, "The Gift" teeters on the verge of becoming damaged goods as it descends into the tired old horror/thriller conventions that you would expect in a much lesser film (such as some "Scream"-wannabe). The story revolves around Annie Wilson (Blanchett), a widow living in Brixton, GA with her three sons. Annie was born with a gift, a special ability to have visions of the future or catch glimpses of remote events, passed down through the women of her family. And ever since her husband died on the job over a year ago, she has been supplementing her social security by using her gift to do psychic readings out of her own home. Unfortunately, there are those who don't like what Annie does for a living, such as Sheriff Johnson (J.K. Simmons, seen recently in "Autumn in New York"), who thinks it is all an act. However, there are others who accuse Annie of consorting with the Devil with her 'witchcraft', and their ringleader is the volatile and dangerous Donnie Barksdale (Keanu Reeves of "The Matrix"), who also happens to be the abusive husband of one of Annie's clients, Valerie (Oscar-winner Hilary Swank of "Boys Don't Cry"). However, Annie is soon thrust into the spotlight when her visions are credited with helping local police find the body of murdered rich girl Jessica King (Katie Holmes, seen recently in "Wonder Boys") in a local swamp. Unfortunately, her visions shed no light on the identity of the killer, and soon she believes that she may be the next target. But who could the killer be? Is it Donnie, on whose property the body was found, and who has also been overtly threatening Annie and her family? The clean-cut principal of the local school, Wayne Collins (Greg Kinnear of "Nurse Betty"), who was Jessica's fiancée? 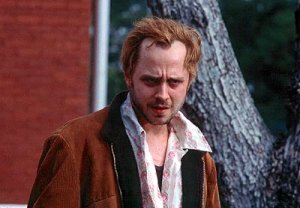 What about the deeply-disturbed auto mechanic Buddy Cole (Giovanni Ribisi of "Gone in 60 Seconds"), who is a regular client of Annie's? Or what about David Duncan (Gary Cole of "Office Space"), the district attorney prosecuting the case, who may somehow be involved? Meanwhile, there are those who believe that the killer is, in fact, Annie herself. For the first hour, "The Gift" is quite fascinating, as Thornton and Epperson use the Southern setting to great effect in populating the town with credible characters that only enhance the backwoods atmosphere of the film. Using his distinct eye for visual storytelling, Raimi develops the suspense slowly but surely, throwing strange visions and small crises Annie's way, until it finally cumulates into a full-blown murder mystery, including the requisite red herrings to throw both Annie and the audience off the trail of the real killer. Unfortunately, despite take the time to build Annie into a fully-fleshed, strong, and sympathetic protagonist, "The Gift" takes a turn for the worse as it descends to the level of yet another by-the-book horror/thriller movie-- the type where the IQs of the characters suddenly drop for some inexplicable reason, such that the protagonist does something stupid enough to put them in harm's way and face-to-face with... the killer! Of course, this is not the first supernatural thriller film to make such a mistake-- last year's "What Lies Beneath" was even more blatant, and that film was also saddled with a trailer that destroyed whatever suspense there was in its first half. Thankfully, the performance delivered by Cate Blanchett makes the second-hour transgression of "The Gift" somewhat tolerable. Her portrayal of a determined yet emotionally-vulnerable single mother serves as the film's emotional center, and this is probably her best role since her Oscar-nominated performance in 1998's "Elizabeth". Keanu Reeves, playing a bad guy for a second time in a row (as in last year's "The Watcher"), is truly frightening as the most threatening force in Annie's life. Giovanni Ribisi also does an excellent turn as a troubled man whose long-simmering rage eventually explodes, while Hilary Swank acquits herself well as a battered wife who finds comfort in Annie's company. The only questionable bit of casting lies in the jarring presence of Katie Holmes, who looks as though she should be one of Wayne's students, as opposed to being his fiancée. Despite such deceptive appearances, Holmes' portrayal of Jessica is suitably shallow and cavalier. Director Sam Raimi has been busy reinventing himself for the past few years. Three years ago, "A Simple Plan" marked his first foray into more mature and dramatic fare, and then he further distanced himself from his horror roots with the baseball film "For Love of the Game". With "The Gift", he shifts back to thriller/horror territory, though with a decidedly more mature approach. Though the film ends up descending into a generic thriller, Raimi's trademark direction and the performance he elicits from Blanchett save "The Gift" from being returned unopened. Images courtesy of Paramount Classics. All rights reserved.